Large expanses of lawn, called "green deserts" offer little for hummingbirds. We have selected the most desirable native species and open-pollinated varieties; all rich with nectar. Varieties are chosen to provide blooms from spring to fall to encourage your winged visitors to visit all summer and return to your garden every year! Top 10 Attractor FlowersWe have selected the varieties hummingbirds seek out above all others for their nourishing nectar. These amazing birds feed up to 8 times an hour consuming ½ their body weight in sweet nectar every day! 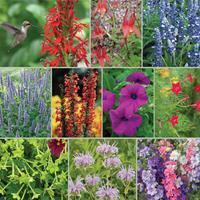 Includes individual packets of native Agastache, Columbine, Ipomopsis, Lobelia, Monarda; and Cypress vine, Larkspur, Petunia, Salvia, Tobacco. Annual and perennial seeds. Approximately 2000 seeds. Plants 200-400 sq ft. Blooms spring to frost. Growing and planting information included.